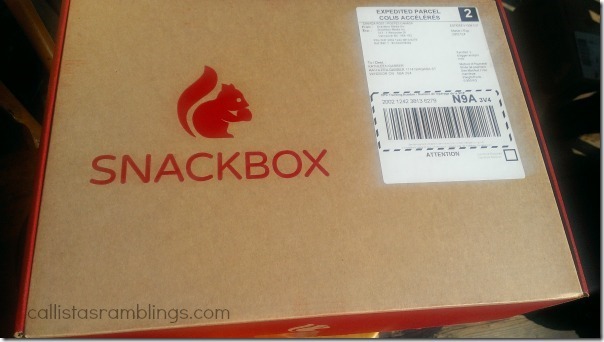 Snackbox is a monthly subscription box that sends you organic snacks each month to try out. I have heard lots about the monthly subscription trend but hadn’t tried one out until now. Snackbox sent me one box to try. I told them that I was unsure about having organic snacks as I don’t usually eat organic and the few organic foods I have tried didn’t taste that good to me. They took it as a challenge. Below is what the box looks like when it arrives at your house. When you open it up, the first thing you see is some pamphlets that tell you about Snackbox and more importantly, information about all the snacks included in that month’s kit including price and where they can be purchased. This is important so you can find more of the snacks that interested you. Each month they send different snacks. Past the pamphlets and brown paper you get to the good stuff. The particular month’s treasures. The November box had all of these snacks to try out which includes 2 drinks, multiple snacks of various types and a seasoning mix to add to cooked cauliflower. Arora Creations Gobi Spice – we haven’t tried this yet as I’m a little nervous since it’s an Indian spice. It shows cauliflower on the package but the pamphlet contained a recipe with chickpeas using the spice. Enerjive Quinoa Skinny Cracker – These were pretty good but they take some getting used to. My cracker loving daughter didn’t like it. It does have a much denser flavour. Teas’Tea – I received unsweetened green tea but I haven’t had a chance to try it yet. Bella Viva Orchards Pear Slices – Dried fruit without any added preservatives or additives. Very rubbery but good. Was hard to bite into but had a nice natural sweetness. You could tell it was pear and not processed at all because each piece is in the shape of a sliced up pear, skin and all. Cocolico Toffee Coconut Dark Chocolate – A chocolate bar. I normally don’t like dark chocolate but was pleased to find out this was DELICIOUS! It didn’t last long. However at $6 for one bar, I would not be purchasing this on my own. Lara Bar – I had my husband try this one out. He wasn’t thrilled with it. It’s a bar of unsweetened fruits, nuts and spices. Veggie Straws (Sensible Portions) – I sent these to school with my youngest daughter because I already knew she liked them. We had a chance to try these a few times at the playgroup we frequent. All the kids and parents loved them but she loved them the most of my kids so I sent them with her. She polished them off. My Smoothie Green – My daughter wanted to try this so I let her have it and she said it wasn’t good and tasted like leaves. That actually makes sense since its ingredients include mango, guava, spinach, nettle, wheatgrass, broccoli and green tea. I wasn’t able to try it. Pirate’s Booty Cheese Puffs – I have saved these for the stocking as they have Sponge Bob on them and my kids LOVE Sponge Bob. True to Nature Hemp Protein Bar – I gave this to my husband and he says it was pretty good. He loves nuts. It also has hemp hearts as a natural source of protein. 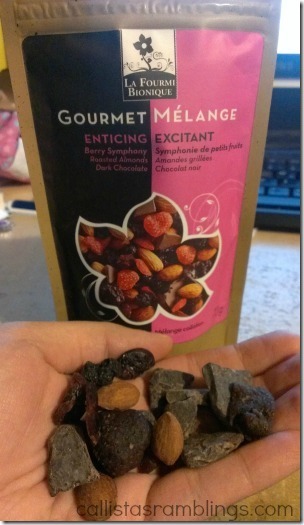 La Fourmi Fruit & Nut Medley – This was by far the most tastiest of the snacks and one I would buy again. I included a photo below. The dried fruits were delicious and not your usual fruits but ones such as cranberries, strawberries, cherries, blueberries and even Goji berries. the nuts were almonds. The bits of chocolate just made it even more heavenly and again it was dark chocolate but I loved it. I don’t even like cherries, at all. However I ate all the dried fruit and I liked all of them. As you can see, we liked some of the snacks, others were okay and others were not for us. That’s the whole point, to be introduced to new snacks and then you can either add them to your shopping list or forget about them. 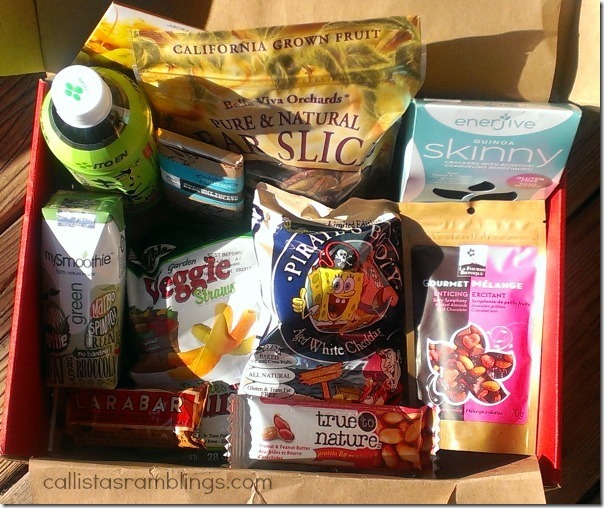 Snackbox offers 1, 3 and 6 month subscriptions which gets you 10-12 healthful snacks worth over $40. Find out more or grab your subscription. 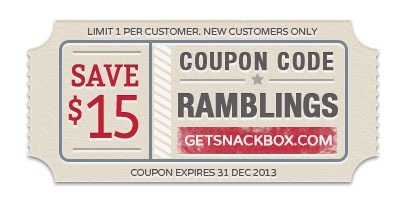 Save $15 off your first snackbox until December 31, 2013 using this coupon. 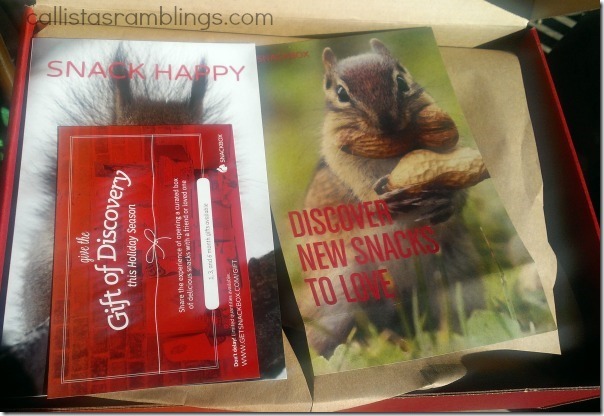 I have one Snackbox to giveaway to a Canadian. You will receive one box and will not be subscribed. You will not receive the same box I received but will receive whatever snacks are in that month’s box.